Considering the great work that the NYRA chart callers generally put out, it’s rare to find horses like CAROLINA COURAGE (#4)—runners who encountered trouble that went undocumented in their published running line comments. Last time out, his rider got a bit too concerned with saving ground on the turn and ended up getting his mount shuffled back before having to steady sharply behind a tiring runner at the quarter pole. He eventually got clear late after weaving his way through traffic and probably could have been third with a clean trip. Now he’s dropping in class and facing a much softer field. Beyond him, this race is fairly wide open. Mini Megan (#1) figures to take plenty of money, but she was pretty disappointing last time after earning a competitive speed figure two back. Perhaps the sloppy track was her undoing that day, but she catches another wet track today. 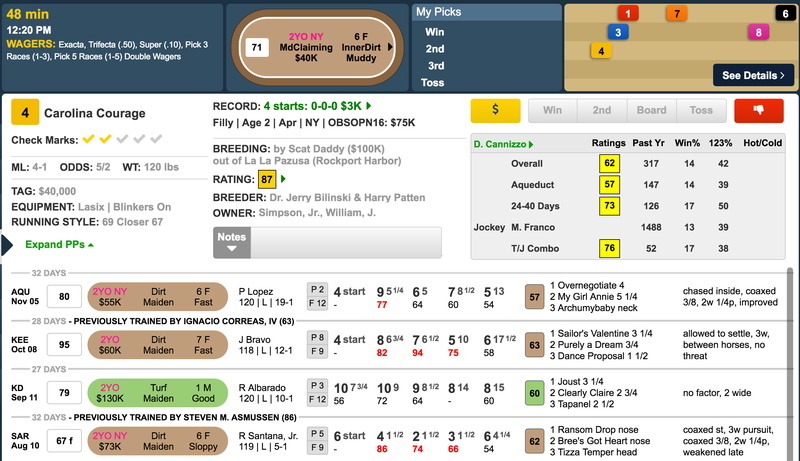 I also would throw in Bank Elaboration (#3), who finished just over 4 lengths behind Mini Megan in that one’s best performance and should have more room for improvement, and Timely Tradition (#5), who drops out of maiden special weight company after making her debut on turf. Jacqueline D (#6), Salori’s Bank (#7), and Wish Upon (#8) also have to be used in some capacity, but the Schettino trainee may not necessarily be a dirt horse, and the latter two are coming out of some weak races.